Bead embroidery on felt. 2″ x 2″ (5cm x 5cm). >I love all of your beaded animal and bird pins… they’re wonderful! I see at lease one of them sold. Yay! Faz will be great too, full of personality just as he is in real life!Thanks for your visits to my blog… You asked if I got the idea for a door that opens from you… not that I’m aware of, although it does sound like something you’d do too.Robin A. 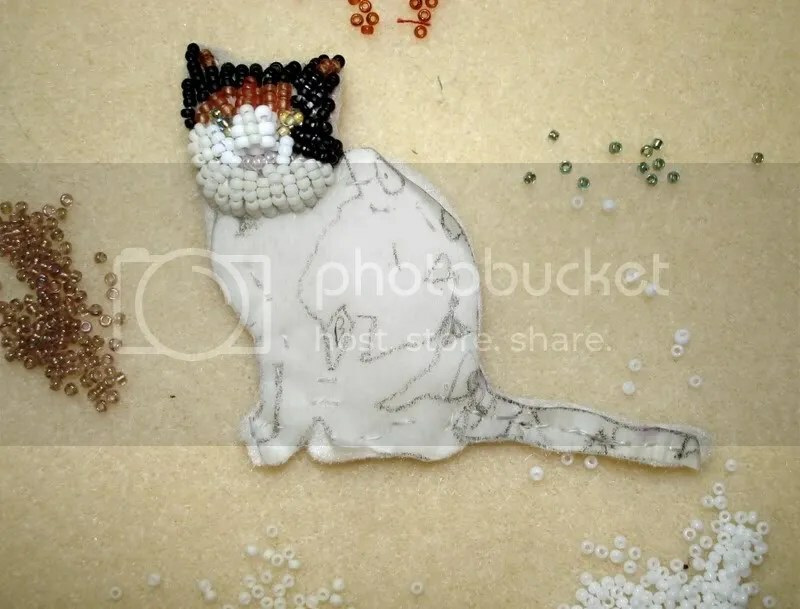 >I love these little beaded critters, LB! A nice change of pace for you, I suspect. >Faz the Cat looks remarkably like our cat we had for 19 years. I may have to book mark her. You’ve set yourself quite a task, but I think you’re up to it. It will be fun to see in the next day or two. >A very cute puss indeed! >Do British cats love fish n’ chips too? >It looks vey intricate. I love seeing the process!